Do You Need Tomato Cages or Stakes? Definitely! Without tomato cages or stakes, much of your fruit will rot on the vine. Additionally, using cages or stakes will ease the weight burden on the tomato plants themselves. 20-30 pounds of fruit is a lot for a tomato plant to support on its own. By supporting your tomato plants with cages or stakes, you eliminate that burden and prevent the fruit from laying on the ground and rotting. Additionally, a well supported plant is likely to produce more fruit. Tomato cages come in a couple of different styles. Most cages are made of wire. There are square cages and round cages. Some cages sit on top of the ground and are anchored to the ground utilizing a metal or wooden stake. Others are tapered and have attached tines that you can stick in the ground directly. All types of cages can and will work well for your tomato plants. It all boils down to personal preference and availability. 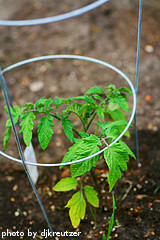 Tomato cages are usually available at your local home improvement store or garden center. Whatever style of cage you choose, you need to make sure that it is tall enough and strong enough. It needs to be at least 4-5 feet tall and at least 18 inches in diameter. Additionally, the wire should be strong enough to support 8-10 pounds without bending or collapsing. The cage should be installed when the tomato plant is about 12 inches tall. When installing the cage, make sure that it is anchored to the ground securely so that it won't blow over in a high wind or fall over due to the weight of the tomatoes. Only one cage should be used per plant. Tomato stakes are also a good option for supporting your tomato plants. Stakes can be made of wood or metal. They should be driven into the ground 3-4 inches to the side of the tomato plant. One stake is used per plant. The tomato plant is then secured to the stake utilizing an elastic type material that will flex as the plant grows. Old pantyhose or thin bungee cords work well for this purpose. Over the course of the growing season, more ties are added to support the plant as it grows. If using wooden stakes, choose ones that are 6-7 feet tall and 1 inch square. Make sure to avoid using chemically treated wood. Drive the stakes approximately 1 foot into the ground to ensure that they will support the weight of the plant. If you choose to use metal stakes, concrete rebar works well. Again, drive the stakes approximately 1 foot into the ground. Stakes should be installed when the plants reach 12 inches tall. Add an additional tie for every foot the plant grows. If you elect to use tomato stakes, you will need to prune your plants as they grow. The tomato plant consists of a main stem. Fruit producing branches emanate from the main stem. 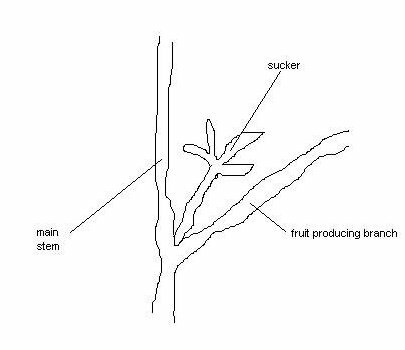 Suckers will typically grow where the branches meet the main stem. You should prune most of the suckers, leaving 3-4 fruit producing branches per plant. This can be accomplished by pinching off the suckers with your fingers, or using garden shears. If you choose to use tomato cages, you can still prune the plants. This will produce less fruit. However, the fruit that is produced will be larger. 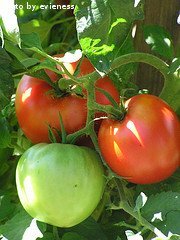 If you use tomato cages and do not prune, your tomato plant will produce more fruit, but the fruit will tend to be smaller. A third option is creating your own support structure to hold the plants off the ground. We grow dozens of tomato plants and prefer to use fence posts and twine to support our plants. Simply pound a fence post or stake in the row every 4th plant. Make sure the stake is at least 5-6 feet tall and sink it at least 1 foot into the ground- it's going to be supporting a lot of weight. String up twine between the posts every vertical foot or so as the plants grow, starting at 1 foot off the ground. Make sure the twine is nice and tight. We do just 1 level at a time, adding more twine as the plants grow. When you're done, you end up with a nice hedge of tomato plants.